During the busy school schedule, it’s sometimes hard to remember setting aside adequate time for effectively preparing your child for a game. Whether it’s soccer, football, tennis, softball or swimming, gearing up your child mentally and physically will help your child perform well and thoroughly enjoy the sport. Develop a consistent pre-game routine for your child. Help your son or daughter understand that playing in an organized sport involves more than showing up and playing. It’s about having fun, being on a team, practicing good sportsmanship and staying fit. Limit eating before a game. Serve foods high in protein such as oatmeal, eggs, nuts, banana or an energy bar three hours before a game and avoid sweets. Young athletes should not eat during the hour leading to a game. Keep your child well hydrated, drinking plenty of water the day before a game. Your child then needs to moderate water intake right before a game to prevent becoming sluggish with too many fluids. Please note there is no better substitute than good old H20. 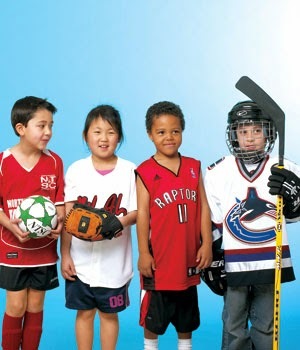 A good attitude for the game rests on a child’s self-esteem and encouragement. Give your child positive reinforcement and take time to listen to his/her concerns. The game is about fun and building confidence, as well as developing character. A good night of sleep not only helps learning, it is also essential for making quick moves on the playing field. Experts point out that a child needs eight to eleven hours of sleep each night to become fully rested. For many children, particularly on Friday nights, getting a full night sleep is not a priority. Encourage your child that sleep is important for maintaining peak performance and a healthy attitude. Taking a shower and reading a book is far more effective in helping a child relax compared to watching television or playing video games. Warming up and stretching before practices and games helps reduce injuries such as muscle tears and sprains. Find out what types of warmups and stretching are used in the sport your child is playing in. Encourage making it a habit to always warmup and stretch before any physical activity to gain flexibility, blood flow to muscles, joint range and motion.